This post contributed by Calum Cockburn and Lauren Rozenberg. 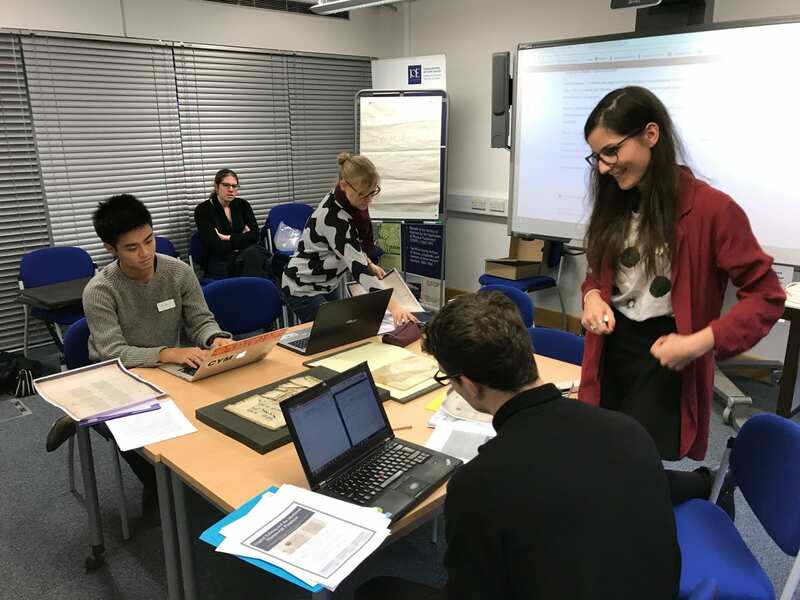 On the 8th and 9th December 2017, UCL Special Collections hosted the third workshop in the Digital Editing and the Medieval Manuscript Fragment series (DEMMF), organised and taught jointly by UCL and Yale postgraduates students to twelve graduate students (the majority of whom are UCL-based). 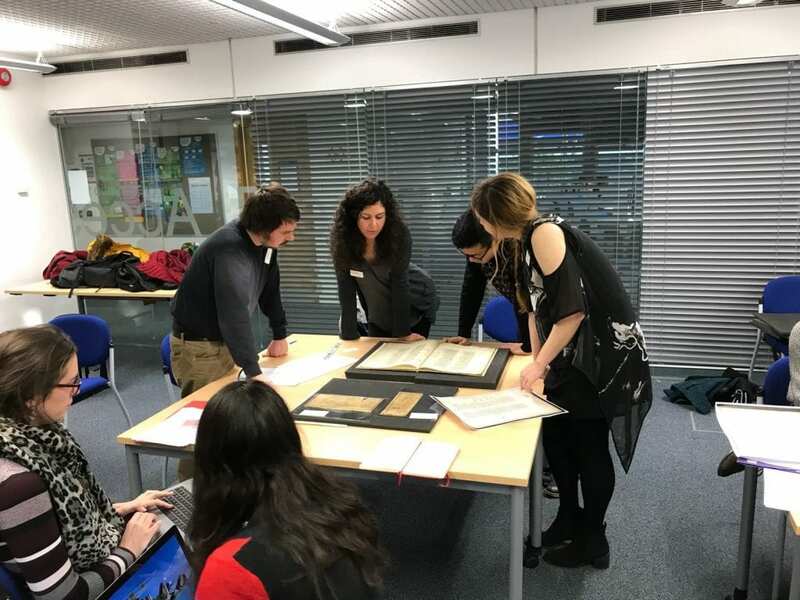 The workshop began with a lecture on UCL’s manuscript fragment collection and a handling session held at the Institute of Education library led by Katy Makin (UCL Library Services). A huge variety of materials was on on display, including a leaf from a music manuscript, once thought to have been used as a binding for an Early Modern book; a thirteenth-century breviary with a charming inhabited initial; a Hebrew papyrus from the Book of Genesis; and a tiny piece of parchment with lines from Euripides’ Medea. Examining these materials, the participants were introduced to the unique and complex challenges literary scholars and digital editors face in creating literary editions from medieval manuscript fragments, fragments that often vary considerably in size and shape, in the legibility of their scripts and hands, in the nature of their decoration and layout, and the amount of damage they have sustained during their different lifetimes. The students examining the the Confessio Amantis fragment. The ultimate aim of this workshop was the collaborative transcription, encoding and publishing of a digital edition of a four-leaf fragment of the Confessio Amantis ‘the Lover’s Confession’ (MS FRAG / ANGL / 1), dated from the fifteenth-century and now housed in UCL Special Collections. This poem is a 33,000-line Middle English work by John Gower (d. 1408), a contemporary of Chaucer (d. 1400), whose compositions were particularly popular during the late medieval period. This text alone survives in 59 copies, one of the most copied manuscripts that survives to us, alongside the Canterbury Tales and Piers Plowman, written by William Langland (d. 1386). The Confessio uses the confession by an ageing love to the chaplain of Venus as the framework for a long series of shorter narrative poems, linked thematically by each of the ‘Seven Deadly Sins’. UCL’s fragment is unique in the collection in that its four leaves were given their own brand new binding at the turn of the twentieth century. It originates from Book V of the poem, concerning Avarice. To aid them in the creation of their edition of this text, the graduate students took part in a series of discussions and exercises concerning the palaeography and codicology of fragments, digital editing and TEI markup, the use of XML editing tools, most notably oXygen software, and project-based collaboration in the digital arena. Subsequent sessions across the two-day event focused on the teaching of common markup languages and the Text Encoding Initiative. Subsequently, this expertise was used to mark-up and encode UCL Special Collections’ Confessio Amantis. The fragment itself reflects issues frequently encountered by digital editors of manuscripts and fragments. Most significantly, the fragment’s leaves are actually bound in the wrong order, an observation unrecorded in the manuscript catalogue itself. Students and instructors examining the Confessio Amantis fragment and discussing its features. The first folio ranges from lines 775 to 966 of Bk. V while the second one jumps to line 1735 continuing to 1926, before returning to lines 1159 to 1541 over the last two folios. Additionally, the fragment includes numerous small illuminated initials and marginal Latin glosses, separate from the main body of the text, and this raised questions across the weekend as to what the workshop participants should mark up and thus include in their edition itself. 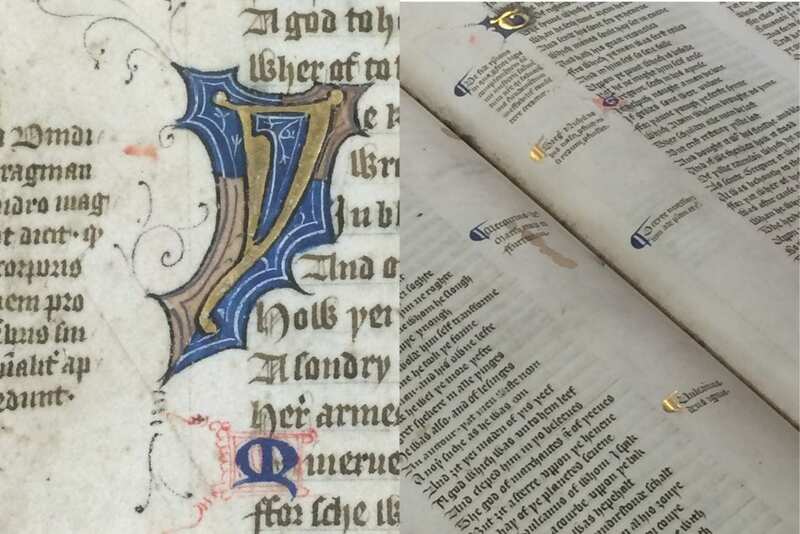 Such issues prompted the students to think about the nature of the text and the materiality of medieval manuscripts, and to consider fragments as objects rather than simply illustrated books. Special Collections provided invaluable high definition images of the fragments. This helped students to prepare their own transcriptions of each manuscript page, and in addition better grasp the necessity for scholars of medieval manuscripts in the digital age. Digital reproductions can indeed alter our experience of the text in different and unforeseen ways. The finished digital edition of our own fragment will be published online at the end of this year, accompanying an edition of another item in Special Collections, a medical manuscript (MS / Lat / 7), transcribed and encoded during a similar workshop that took place during the summer. The December workshop was made possible thanks to the support of UCL Doctoral School, the Octagon Small Grant Fund, the UCL English Department and Yale Beinecke Rare Book & Music Library. We’re especially grateful to Katy Makin (UCL Special Collections Archivist), for allowing us access to the fragment collection and assembling these materials on the day, and to Dr. Alex Lee (UCL SELCS), for all her palaeographic expertise and help in the transcription of the document itself. The DEMMF workshop was coordinated by Dana Kovarik (UCL PGR English). The team of instructors included Ph.D. students from a number of different departments and institutions. From UCL’s Arts & Humanities and Social & Historical Sciences faculties: Calum Cockburn (UCL PGR English), Lauren Rozenberg (UCL PGR History of Art), Agata Zielinska (UCL PGR History). From Yale University: Gina Marie Hurley (Yale PGR Medieval Studies) and Mireille Pardon (Yale PGR) as well as Stephanie Azzarello from Cambridge University (Pembroke College, History of Art).